Former Aramcon Jo Watts is Still Playing in the Mud! It’s been 17 years since Jo Watts left Saudi Arabia, but the former Aramcon is still playing in the mud. 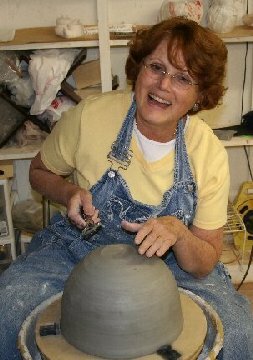 She has recently opened a pottery studio in Smithville, Texas; however, her path towards becoming an artist began long ago. The two had three children. Their oldest son, Tommy Jr., was a senior in High School and stayed back in Louisiana with relatives. The second son, John was in middle school in Ras Tanura. The youngest, Jimmy was three when the family first arrived in Saudi Arabia. When they left seven years later, it was the only home he knew. Her first home was in the Dhahran North Camp where Tom worked in the Expec Department. She enjoyed making new friends and exploring Al Khobar, Dammam, and the Main Camp. It wasn’t long before she joined the Art Group in Dhahran and became the treasurer. After 8 or 9 months, Tom was transferred to the refinery at Ras Tanura. They received the much coveted opportunity to live on main camp where there were no more bus rides to the mail center, commissary, or Art Center. Her first official act in Ras Tanura was to join the Art Group. After several months, she was able to find a kiln and set up a studio in her home, but she still continued to spend a lot of time with friends and fellow artists at the Art Center. Jo participated in all of the art shows in both Ras Tanura and Dhahran, and taught pottery and sculpture. Jo’s “partner” was Mary Watts. They weren’t related but everyone assumed that they were. They worked together on projects that were exhibited and sold in various shows in the camps. One of her other interests was the Players’ group. Jo, along with her family, participated in the RT Players' Group. Her first time on the Ras Tanura stage was in a farce called “Spy Me This One” which was directed by Karen Fallon. 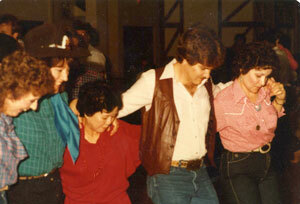 Jo’s husband, Tom, and Mary’s husband, Doug, played country music; they played for dances at the surf house. Jo sometimes sang with them. Jo and Mary were also involved in the Chili Cook-Off while in Saudi Arabia. The cook-off was organized by the Women’s Group who asked Mary if she and Jo could come up with some sort of loving cup as an award. At that time, Jo did not “throw” pottery – that was Mary’s job. She threw the pots on the wheel and Jo embellished them or decorated them. Mostly, she made faces on them. 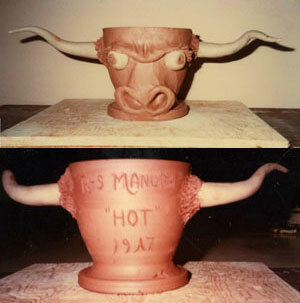 They put their heads together and Mary came up with the idea to make the cup into the shape of a bull. Jo carved the event and date into the back of the cup. It said, “First Place in the Ras MANURA Chili Cook Off”! Like most Aramcons, they had fun every chance they got! After Jo left Saudi Arabia, she no longer had Mary to throw pots for her, so she had to learn how to do it on her own. 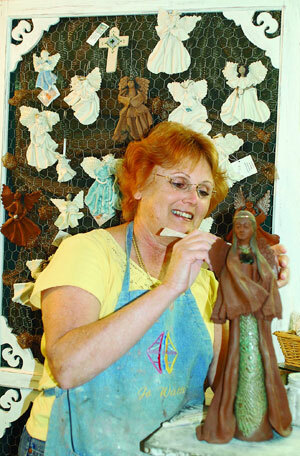 It took her a year of practicing on the wheel, several hours nearly every day, to achieve Mary’s quality of work. All of her practicing has paid off as she is now renting studio space in the Artists n Action Gallery in Smithville, Texas. Jo uses this studio to exhibit angels, birdfeeders, mugs, and her famous chili bowls. She is currently giving classes to adults and workshops for children. Following in the footsteps of his mother, J.W. who now goes by the name of “Dub Watts,” is an artist as well. He will be in a new Daniel Day Lewis movie called “There Will Be Blood,” and is working on various other projects in Smithville. Tommy Jr., the oldest son, moved to Smithville from Alaska to reunite with the family. His son, Severn is 5. Jimmy, who spent most of his young life in Saudi Arabia, is the father of Willie (4 years old) and Marleigh (three years old). He and his wife Amy live about five miles from Jo and Tom. The Watts’ live in the center of 23 acres between two state parks. It is lovely and quiet but not too far from civilization. Tom is not yet retired and spends much of his time on the road for G.E. 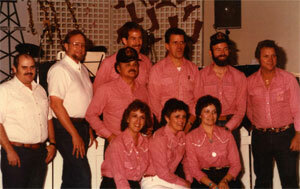 Jo and Jimmy were on the first Aramco evac flight in August of 1990. It’s been years of searching for and finding friends who stayed behind or left later. She would love to visit and catch up with former Aramcons. To visit the studio, call 512-237-2240, or visit their website at www.artistsnaction.com.